When I was first exposed to the New Urbanism in the 1990s, it was as a 9 to 5 ad-man with an appreciation for music and art. Killing time one day in my dentist’s waiting room, I stumbled upon “Bye-Bye Suburban Dream,” the cover story of the latest Newsweek magazine. I still remember the feeling I had as I read it. Unbelievable, I thought. This is a movement creating places where people, community, beauty and culture are once again prioritized. Where the interconnected everyday experiences that color our lives are valued. Where commerce and art can both thrive. If the attendees list of Placemaking@Work, my monthly webinar series, is any indicator, we’re increasingly united in our desire to improve the places we call home, wherever those places might be. Last month, I had participants from Hawaii to Russia, from British Columbia to Saudi Arabia, and many points in between. How California will redevelop its existing communities in the future is up for debate. And, it’s about time. The role of redevelopment in shaping our built environment came to its crescendo in the halcyon days of 2005 over Kelo vs. New London. Today, Susette Kelo’s home sits as a vacant scar on business-as-usual redevelopment practices. Brave New Codes Reach Tipping Point: When, Where, Why? A year ago, Apple’s sales of its iPhone and iPod Touch eclipsed 40 million units, confirming their potential to fundamentally retool our future opportunities and patterns of daily life. 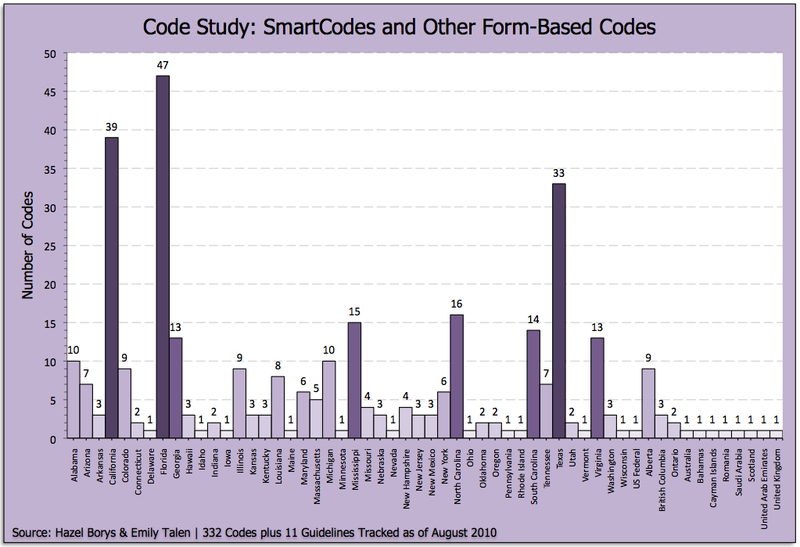 Today, a year later, form-based codes hit a similar milestone, with similar implications, as over 330 cities and towns around the world — representing over 40 million people — have embraced the idea of form-based coding as an alternative to the sprawl-inducing zoning models of the past century.